Companies evolve their business models in response to shifting external forces, including new customer preferences, competitive threats and technology innovations. In some cases, industries - and their surviving participants - transform completely, as witnessed in media and possibly soon, in retail. In other cases, specific processes evolve within an otherwise stable business model, as witnessed by auto manufacturing during the twentieth century, first with Henry Ford’s assembly line, and second with the Toyota Production System. Presently, amidst an era of digital transformation, companies of all types are accelerating digital product development to remain competitive. In this article we explore recent trends of IT development as a critical component of enterprise strategy. We explore how leading technology companies shape customer expectations and product development best practice, and the resulting impact on - and reactions by - traditionally non-tech companies. We conclude with a case study that illustrates how evolving IT strategies now incorporate on-demand teams to accelerate critical projects. Business function best-practices evolve. Six-sigma and lean re-defined manufacturing, while CRM and Marketing Automation Platforms accelerated sales velocity. Enterprise Resource Planning systems have helped companies manage disparate data for decades. Within IT, product development and project management approaches have also evolved in response to changing customer requirements and new enabling technologies. Historically, enterprise IT teams were organizationally distinct and they built products according to rigid plans. Infrastructure (hardware) and applications (software) were separate, and within each category, technologists specialized on discrete tasks, such as software engineering or network administration. This approach was called the waterfall method. For both infrastructure and IT, waterfall development scripted highly specialized steps and roles, all designed to exquisitely predict every element of a single, complex product. A hallmark of 20th century manufacturing, this sequential development approach borrowed from meticulous planning used to build products such as space shuttles and the Hoover Dam. For both infrastructure and IT, waterfall development scripted highly specialized steps and roles, all designed to exquisitely predict every element of a single, complex product. For projects with clearly defined scope and requirements, built with well-understood technology, the waterfall approach is suitable. However, even with these variables defined, intensive planning lead to longer development times. Further, even with the best initial plans, the changing needs of technology users - both within and outside the company - contrasted sharply against the fixed variables of damming a river. Fluid demands called for flexible production. 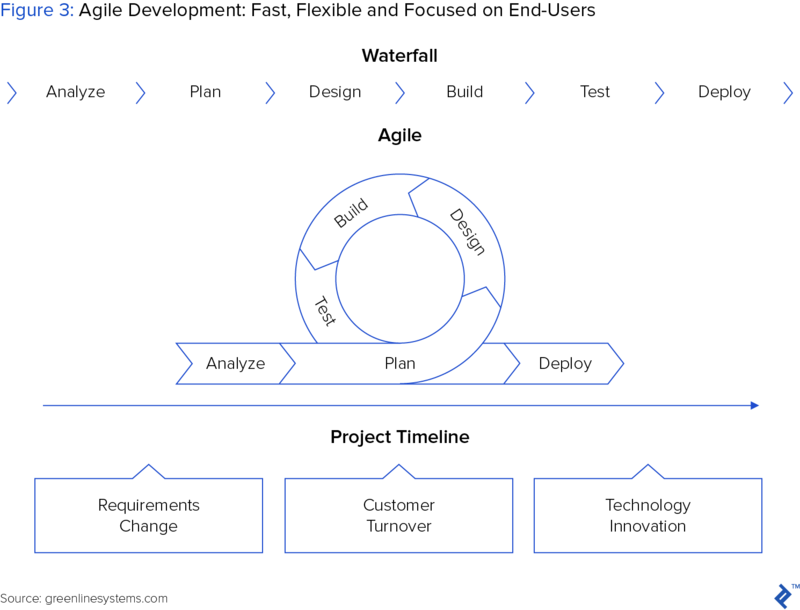 What is now known as Agile development was born, or at least canonized, during a ski trip meeting of several leading software developers during the early 2000s. They aimed to develop methods to quickly build working software and deliver it to end users. 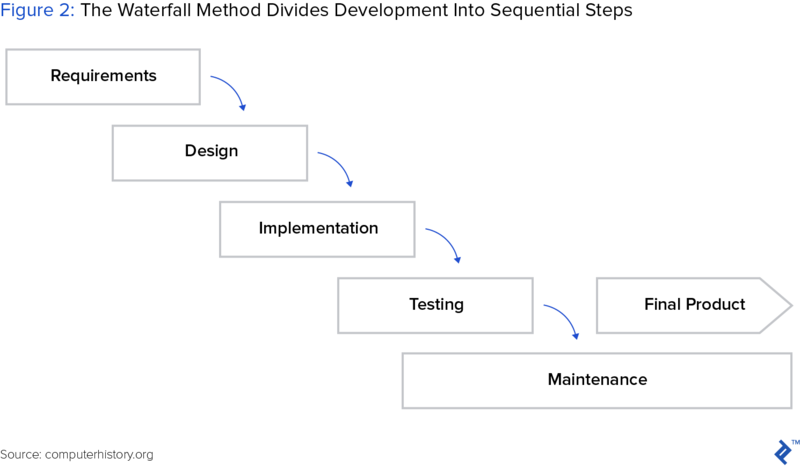 In contrast to the waterfall approach, which resolutely marched towards a highly-defined product, the agile method continuously built, tested and refined product in response to end user feedback. For startups and tech companies, adopting agile as the prevailing development method was easy. No legacy systems or specialized roles stood in their way. However, for companies with legacy infrastructure such as on-site servers and highly regimented IT organizations, pairing fast-moving agile with comparatively glacial infrastructure workflows proved daunting. Leading consulting firms proposed two-speed IT, whereby infrastructure and application teams remained largely separate but were encouraged to work together. Despite its period of prominence, two-speed IT was ultimately considered limited, and soon surpassed by holistic practices that integrated infrastructure and applications. As covered in depth in our previous article, DevOps describes an integrative approach to software development and systems administration. Expanding the Agile lens, it encompasses software development (Dev) and operations (Ops), and describes a type of engineer, culture and practice that collectively enable a company to deliver new and improved technology products at high velocity. 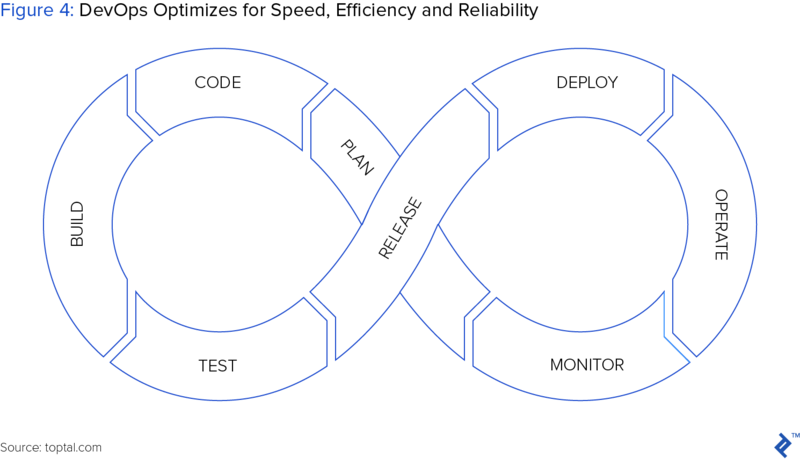 Perhaps its most critical distinction versus Agile, DevOps focuses not only on the rapid development of functional software, but also on its continuous delivery to customers. The later objective requires a holistic view of both upstream software development activities and downstream infrastructure management. It also incorporates a variety of off-the-shelf cloud services, such as Git for code repository, and Microsoft Azure, AWS and Google Cloud for rapid deployment of cloud-based applications. Marshalling these cloud resources, DevOps teams gain control over critical infrastructure-as-code components and self-service capability (no waiting for IT operations to provision infrastructure). 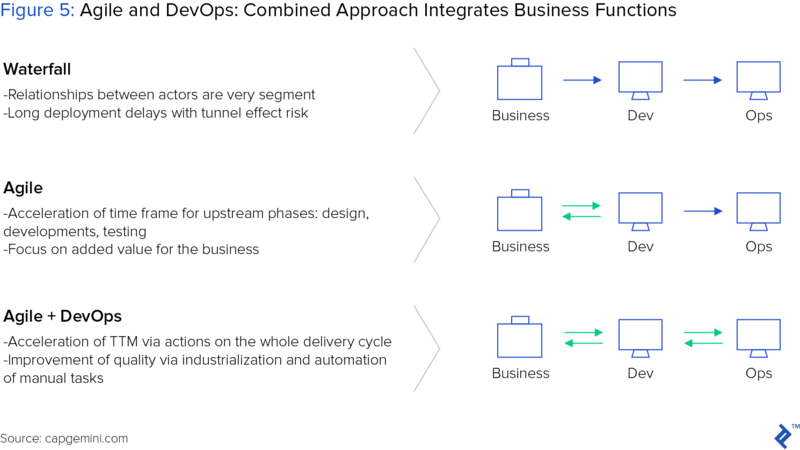 As a result, DevOps teams can more quickly develop, deploy and modify new applications, reducing the time to solving pressing customer needs. Until recently, digital products loomed on the horizon for many large, traditional companies. These innovations instead occupied the domain of digital natives and weaker incumbents, fearing disintermediation by innovative startups. Leading technology companies across multiple verticals are redefining customer expectations. Consequently, nearly all companies stand amidst rapidly shifting terrain, which forces products, and sometimes entire business models, into the digital arena. 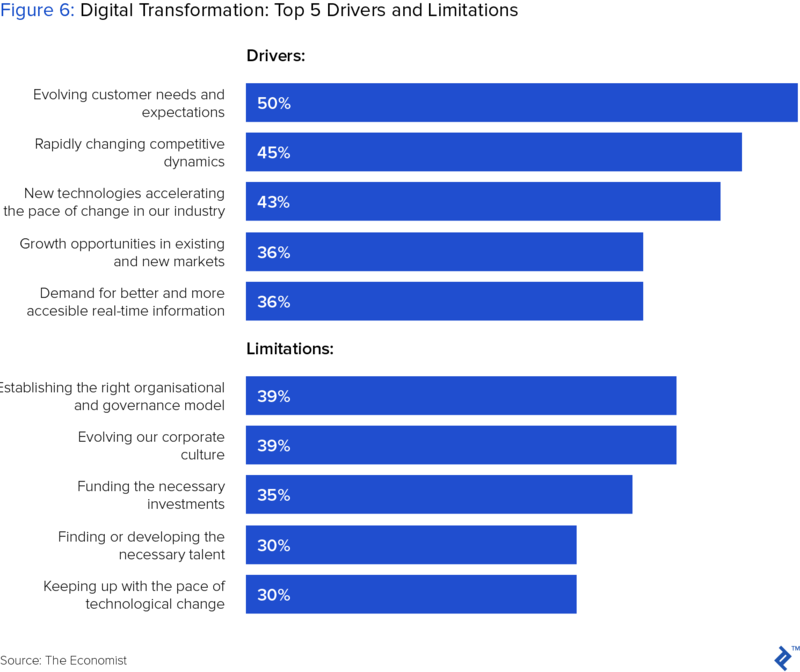 Given this ubiquitous change, digital transformation strategy, and the ability to execute it, are no longer optional. Both the user experience and its enabling underlying technology raise the bar for competitors with outdated business models and technology development practices. Fighting to preserve ownership of the customer journey, legacy incumbents are scrambling to build high-quality, scalable digital products in record time. This approach enables Amazon to quickly release and refine leading applications, such as personalized product recommendations, a seamless e-commerce experience across its website and mobile apps, and an expanding menu of services delivering value - and drawing more users into - its Prime subscription service. In a similar theme, Netflix reinvented media through a technology-first solution. Their cloud-based service enables 118 million subscribers to discover and access a deep, and constantly evolving library of digital content in a seamless experience across a thousand different digital devices. To deliver such a polished experience, Netflix built a fine-tuned product development machine, capable of continuously building and integrating new and refined microservices, a concept popularized by Netflix. With microservices, many of the functions that enable user experience are uncoupled and managed by a distinct team. So, they can be updated independently and more rapidly. Enabling fast release cycles - often within hours - Netflix invested in automated monitoring tools that evaluate the performance of new releases, and direct customers to older versions until bugs are resolved. In response to mounting market forces, competitive threats - both real and potential - and accessible cloud-based technologies, companies are borrowing from the playbook of pioneers such as Amazon and Netflix. Here, we highlight some of the best examples of digital transformation from leading companies in retail, finance and hospitality. Such applications include a variety of “software robots” deployed throughout operations to improve efficiency. Examples include AI-powered chatbots that answer employee and customer questions, and tools that help employees identify information from lengthy audit documents. 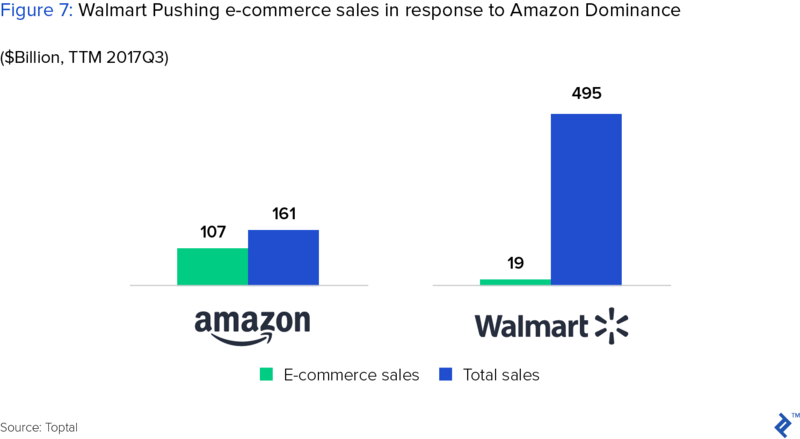 Although WalMart has made the largest investments in digital products, Target and other leading retailers have also shifted to DevOps and ramped investment to meet customer demand. In a similar pattern, within financial services both consumer banking and insurance companies are rapidly introducing new products to meet evolving customer expectations. Presented with technology-first solutions such as Venmo for peer-to-peer payment, and Wealthfront for automated, low-cost wealth management, customers also demand polished digital products from their retail bank. In response, banks ranging in size from regional scale to leading national brands such as Goldman Sachs are launching purely digital offerings. 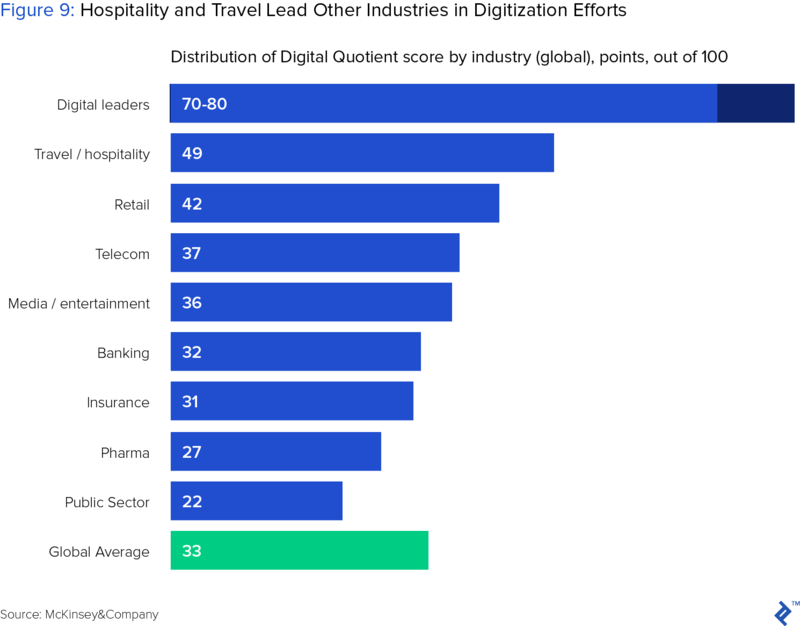 Hospitality and travel shifted online earlier than other industries, lead by several online travel agencies, such as Expedia and Kayak. More recently, hotel and airlines have pushed to directly control the customer relationship, and to compete with technology-first powerhouse AirBnB. In response, they have expanded their online presence to capture direct bookings, digitized their loyalty programs, and built automated dispute resolution tools. In a successful example of digital transformation, Marriott invested heavily and early in its mobile experience, leading the industry by offering guests a variety of conveniences such as mobile check-in and customized amenities. As highlighted so far, a transformation to digital is no longer something that incumbents can file in the “upcoming” queue. Rather, it is an unavoidable must. But while recognition of the need to go digital may be obvious, the path forward is not always so clear. For most incumbents wishing to embark on the path of digital transformation, the response consists of two parts: planned and unplanned technology development. For example, a retailer with minimal e-commerce presence will plan and allocate budget to build a more robust, omni-channel platform. However, a multitude of unpredictable events might immediately surface new technology needs for which no budget or resources exist. Regulatory change might impact how healthcare companies engage patients. New mobile technology might reframe how brick and mortar retailers interact with customers. Any one of the leading cloud providers might launch new services to accelerate the lift and shift migration from on-premise to cloud-based computing. As a result, companies face the daunting challenge of preparing for these often unpredictable changes. To effectively respond to - or even capitalize on - unforseen events ahead of competition, they must quickly spin up teams, develop proofs of concept, and deploy product pilots. To seize the advantage, speed and reliability are critical. Illustrating a textbook transformation case, Outfront Media has adeptly navigated the path from physical to digital products. The company historically sold out-of-home display advertisements, such as billboards, transit-based displays, and large venues such as sports arenas. 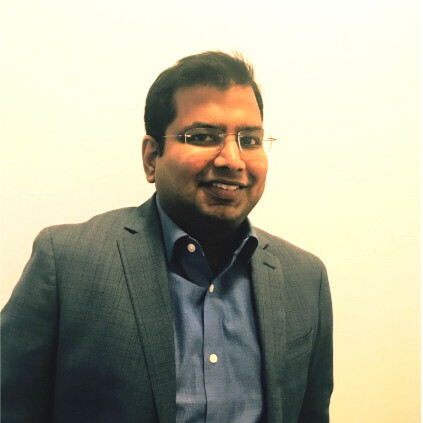 Recognizing the massive shift to mobile and the emerging advertising opportunities borne by digital products, Outfront began building a digital platform capable of quickly launching and scaling new solutions. To accelerate their shift, the Outfront Media technology team relied heavily on on-demand talent, particularly as they sought to simultaneously maintain their legacy system while launching new mission-critical applications. Looking to the later category, according to Outfront Media CTO, Joel Melby, the company is developing and deploying three critical programs within its digital transformation. The largest digital out-of-home (OOH) publishing platform in history (including both hardware and software). An audience-driven sales platform with programmatic and self-service capabilities. A proprietary Data Management Platform (DMP), to provide the necessary audience information. The impact of these programs exceeds that which would result from merely upgrading legacy formats to digital experiences. Indeed, as Melby continues, digital product innovation at Outfront Media is opening entirely new channels and advertising formats to engage their audience. CIOs have been asked to focus on one goal: Delivering exceptional digital experiences to customers. It’s a number one CIO priority in 2018.